Appomattox, a deep-water oil and gas project, is Shell’s largest floating platform in the Gulf of Mexico. In May 2018 the Appomattox platform left Ingleside, Texas, USA for its final location 130 kilometres (80 miles) off the coast of Louisiana. Construction is complete for Appomattox, Shell’s largest floating platform in the Gulf of Mexico. Take a closer look at the Appomattox project during its journey in the videos below. Shell’s Appomattox hull is making its way to Ingleside, Texas where the final phase of host construction will take place. The size and scale of Appomattox are impressive. Assembly of this massive structure involved teams around the globe working to ensure the topsides and the hull fit together like a glove. Take a glimpse at the journey the Appomattox hull has been on for the last couple of years to prepare for its long and impressive trip to the Gulf of Mexico. 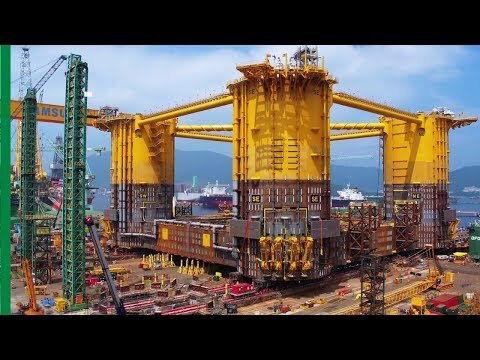 The Appomattox Hull is the largest floating production system that Shell has ever built. Weighing in at 40,000 metric tons in the current state it’s at. So when you think about it, it’s pretty amazing that something that big actually floats, but it does, quite easily. The displacement of it is at 125k metric tons which is actually bigger than the largest aircraft carrier. It’ll be the biggest semi subermisble we’ve installed in the Gulf of Mexico. But while you can engineer anything, it’s always a question of, how do you build this safely? I like to think that I’m here to help people go home safely to their families.We spend time before we even start executing the work talking about safety, talking about expectations, we do team building, we do engagement with the craft. And try to limit our exposure to working at height, confined space, dropped objects. We can do this today safely if we concentrate on our tasks, we don’t rush, and we work the plan. The things that I’ve seen Shell do on this Hull are absolutely amazing. 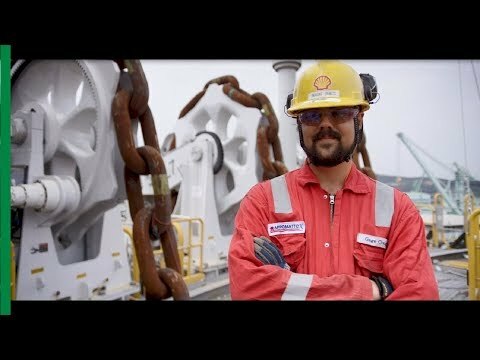 And I think when you just look at the scale, the size, the height… When you see it in person it really brings you a certain sense that Shell is doing great things. To see it finish, finish on time, within budget, and done as safe as its been done is really pretty gratifying for me and for the site team to have delivered like we have. The Appomattox project to me has been absolutely fantastic. There’s some people here that I’ve formed a lifelong relationship with and had lots of fun with them. It’ll be sad to say goodbye to a lot of people we’ve been working with for the last couple of years. Some of the people we’re very close with and have great relationships with. The people that I’ve met are truly incredible. It’s been an incredibly rewarding experience and something I’ll remember for the rest of my life. Animated graphic with map of Geoje, South Korea then rotating around the globe to Ingleside, TX, USA. The Appomattox Hull has “set sail” on its long and impressive journey to the Gulf of Mexico. The successful arrival of the Appomattox hull in Ingleside, Texas was witnessed by staff and contractors located at Ingleside, some of whom lived through the impacts of Hurricane Harvey. Ocean sounds of crashing waves and cawing seagulls. Estuary early morning footage of water lapping the sand, a fisherman walking along the estuary banks, seagulls flying over the water as the sun rises at the horizon. I’ve done transportation for many, many years but this is definitely the biggest thing I’ve been working on. You can’t really beat transporting something that weighs over 40,000 tonnes. Slow motion footage of Jillian Hansen and a colleague, dressed in safety gear, walking against a background of the estuary and cloudy skies. Close-up of Jillian Hansen dressed in safety gear, speaking to the off-camera interviewer. More footage of Jillian and her colleague walking at the construction site beside the estuary. Footage of a construction vehicle passing the shot, construction infrastructure visible in the background against blue skies. Footage of Marno de Jong looking out over the estuary towards the Appomattox hull. Front view of the vessel carrying the Appomattox hull. Aerial view of the Appomattox hull surrounded by water. Bird’s eye view of the Appomattox hull aboard the transportation vessel, surrounded by water. Appomattox is going to be what is called the jewel in the crown of the deepwater Gulf of Mexico project for Shell. Close-up of Marno de Jong, dressed in safety gear, speaking to the off-camera interviewer. It’s only a few months ago that we said goodbye to it in Geoje, South Korea. More footage of the Appomattox hull aboard the transportation vessel, land visible in the distance. A number of workers dressed in safety gear are aboard a vessel in the estuary, looking out over the water. Again, footage of the Appomattox hull aboard the transportation vessel, land visible in the distance. We had to get it here safely. It has a long journey, all the way to Texas, and we’re excited to see it. What makes it unique for me is the fantastic team that we have on Appomattox. Workers dressed in safety gear walk through the construction site, with both external and internal footage of the workers talking and gesturing and greeting members of the construction team. Close-up followed by wider footage of a worker welding. More external footage of construction workers working at the site. Number one goal for us here on the site is safety. Close-up of Kelly Bowen, dressed in safety gear, speaking to the off-camera interviewer. We care for everybody that is on the project and we truly want everybody to return home safe every night. More footage of construction workers working in various areas of the site. This is a category four hurricane. This is going to go up the coast and do a massive amount of damage. A catastrophic event for anyone in the path of this storm. Television coverage of Hurricane Harvey, showing a weather forecast map, followed by miscellaneous footage of the wind and rain and damage caused by Hurricane Harvey, and cutting back to the meteorologist speaking in front of the screen, still displaying the weather forecast map. Harvey intensified so quickly. We were in a position where we could no leave, so we were here during the storm. I think the eye hit us directly. The entire house was shaking, roof was peeling, walls were vibrating. I guess all we could do was be thankful we were still alive. More miscellaneous footage of the damage caused by Harvey. Footage of Kevin MacDonald’s house and yard, showing the damage caused. Mid view of Kevin MacDonald seated in his yard, speaking to the off-camera interviewer. Footage of Kevin surveying the damage to his house and property, cutting back to the mid view of Kevin, as he speaks. The wind is pretty strong, the rains are coming in and the tides now have come in here at Wilton beach. Live television coverage by a reporter of the wind and rain during Hurricane Harvey. The coworkers I had that came here to help me clean up and delivered gas and asked what you need and phoned and checked on you – it’s a family away from home. It’s been amazing to me. Footage cuts several times between Kevin MacDonald walking around his property, surveying the damage, and the mid view of Kevin, as he speaks to the off-camera interviewer. The resilience of the people here at Kiewit, the resilience of the families as we have witnessed through Harvey, has been truly remarkable. Our team is going to be delighted to see the piece of work of two years of hard labour in Geoje, coming to the shores here in Ingleside. And I would like my team to have a proud moment, take a moment to see the hull coming in, and think of the great things they have already done. Reverse view close-up of a man dressed in safety gear, seen against the background of construction site infrastructure and blue skies. Low-angle close-up of the aforementioned man. Close-up of an American flag flying in the wind. High angle view of the surrounding Ingleside area by night. Footage of a construction team, dressed in safety gear, talking together at the construction site. Miscellaneous scenes of work taking place on the construction site. Close-up of Marno de Jong, dressed in safety gear, speaking to the off-camera interviewer. More footage of the aforementioned construction team walking on the site, all looking very pleased. Close-up of Marno de Jong, dressed in safety gear, speaking to the off-camera interviewer. More footage of the group of people standing, in shadow, atop the sand bank, the hull aboard the transportation vessel now much closer to where they are standing. Footage from various angles of the hull aboard the transportation vessel, interspersed with footage of the construction team watching the hull approach while they talk together. More footage of the transportation vessel alongside land, as well as miscellaneous footage of people observing, some taking photos or videos of the arrival. I’m really glad it’s here. All these years of planning have really paid off. Close-up of Jillian Hansen dressed in safety gear, speaking to the off-camera interviewer. Low angle footage of the hull aboard the transporting vessel, now alongside land, while the construction team, in the foreground, look towards the hull. We actually had the opportunity on this project to implement constructability into the design which has significant savings both in HSE exposure, time and cost. Close-up of Kelly Bowen, dressed in safety gear, speaking to the off-camera interviewer. More footage of the construction team walking on the construction site and then walking under a part of the hull. Miscellaneous footage of the construction team working on parts of the hull. It’s amazing how it all starts with plate, and rolled up pipe, and schematic drawings, and it ends up like it is. Mid view of James Welch dressed in safety gear, speaking to the off-camera interviewer. Close-up of the end of one of many pipes on the construction site, seen against a background of blue-cloudy skies. Footage of James walking through the pipes and infrastructure, a device held in his hands. We’ve come a long way and the Appomattox project looks fantastic in terms of its safety, cost and scheduled performance. We need to now finalise this beautiful work of art that we are putting together. Low angle footage of the hull seen against blue skies, construction team members in the foreground looking up at the piece of infrastructure. Bird’s eye view of the hull and vessel alongside land. Aerial footage of the hull. More low angle footage of the hull seen against blue skies, construction team members in the foreground looking up at the piece of infrastructure. Another bird’s eye view of the hull and vessel alongside land as the shot slowly zooms out. Appomattox, one of Shell’s biggest deep-water platforms, left from Ingleside, Texas, USA and headed to its final location in the Gulf of Mexico. Here, meet the team that built it. Time-lapse footage of the Appomattox host being completed at Ingleside, Texas. Text appears onscreen as displayed below. Wide-angled drone footage of the host. Text appears onscreen as displayed below. Further drone footage of the host. Text appears onscreen as displayed below. Quick close-ups of Gage Craig, Irvin Tyler, Jillian Hansen, Mark Kite, Shawanna Reed and Marno de Jong with text onscreen throughout as displayed below. Low-angled close-up looking upwards at Marno de Jong. My name is Marno de Jong. Wide-angled shot of Jillian Hansen smiling into the camera, her arms crossed. Close-up of Sid Johnston smiling into the camera. Close-up of an individual welding. Close-up of a gloved hand turning a wrench. Shot of workers assembling scaffolding. Text appears onscreen as displayed below. Shot of Gage Craig looking into the camera standing in front of the Appomattox. Close-up of Irvin Tyler smiling to the camera. Close-up of Matt Winters nodding to the camera. Split-pane shot of the Appomattox at the top, cyclists on a road, and a close-up of part of the host on the bottom. Text appears onscreen as displayed below. Wide-angled shot of cyclists on their bikes. Shot of Gage Craig. Close-up of Kelly Bowen smiling to the camera. Shot of Marno de Jong smiling to the camera, his arms crossed. Shot of Sid Johnston speaking to off-screen interviewer. Wide-angled shot following an individual walking towards the host’s construction site. Series of quick shots of workers at the site. Text appears onscreen as displayed below. Slow-motion footage of two men walking towards the Appomattox. Close-up of a man and Gage Craig smiling and looking upwards. I think I’ve managed to learn something new every day. Close-up of Mark Kite speaking to off-screen interviewer, the host in the background. Text appears onscreen as displayed below. Displaced weight is around 120,000 tons. It’s bigger than an aircraft carrier. Drone footage of the Appomattox. Shot following Wes Matai as he walks onto the platform. Close-up of Wes Matai turning and looking upwards around the platform. You’re walking up to the platform itself and you’re just in complete awe. Sequence of shots of the platform and inside the Appomattox. Close-up of Gage Craig speaking to off-screen interviewer. Text appears onscreen as displayed below. It’s like a floating city. You really get an appreciation for all the hard work and the different people that come together to build a project like this. Close-up of Shawanna Reed laughing. Low-angled close-up of an individual. Shot of an individual looking out over the site. Time-lapse footage of the Appomattox being assembled. Close-up of Kelly Bowen speaking to off-screen interviewer, the host in the background. Text appears onscreen as displayed below. I’ve known people that I’ve worked with on this project since I started at Shell 34 years ago. Wide-angled shot of materials being lowered down towards two workers. Shot of workers putting on safety gear. Close-up of Marno de Jong speaking to off-screen interviewer, the host in the background. Text appears onscreen as displayed below. I think for a lot of people on the project, including myself, this is a highlight in our careers. Close-up shot panning around Marno de Jong as he looks upwards at the host. Drone footage of the Appomattox. Text appears onscreen as displayed below. Close-up of Shawanna Reed smiling and talking to an individual, then pointing her arm upwards. Oh, I’m super excited. I’m ready to go. Close-up of Marno de Jong and Kelly Bowen looking upwards. A big day. Fantastic day. Wide-angled shot of Marno de Jong and Kelly Bowen in front of the Appomattox as Marno de Jong points upwards. Close-up of Kelly Bowen speaking to off-screen interviewer, the host in the background. It’s time for it to go, but it’s always a strange feeling to see it leave. It’s sort of like, you know, a child leaving home and going off to college. Shot of a rope and pulley. Slow-motion footage of Wes Matai walking on the platform. Shot of three men standing on the platform as two of them shake hands. Wide-angled shot of part of the site with the sun setting in the background. Wide-angled shot of a group of men carrying a thick rope. Close-up of Shawanna Reed speaking to off-screen interviewer. Text appears onscreen as displayed below. I’m proud to be a part of the team that helped push this through all the way around. It’s all about the people. Wide-angled shot of a group of individuals talking at an exterior location as the sun has set in the background. Close-up of the men as one of them laughs. Close-up of Marno de Jong speaking to off-screen interviewer, the host in the background. 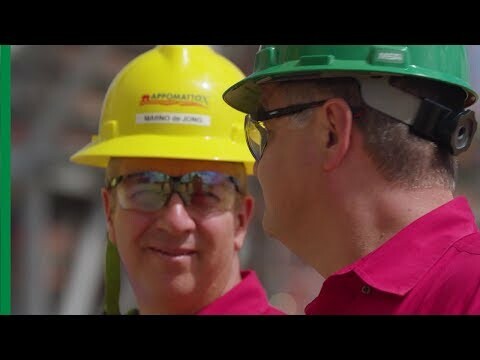 The Appomattox team has truly been a family and you need that family feel to it to really get the intense collaboration that is needed to have an enormous project like this. Slow-motion footage of a man walking towards the Appomattox as the sun has set, the lights coming on on the host. Shot panning around Marno de Jong and Kelly Bowen looking at the host at night-time. Close-up of Mark Kite and others smiling and laughing, then looking towards the Appomattox. Wide-angled shot of the Appomattox lit up at night-time, the silhouettes of various individuals in the foreground. Shot of a group of individuals waving goodbye to the Appomattox as it sets sail in the distance. Wide-angled shot of the Appomattox leaving Ingleside as the sun has set. Text appears onscreen as displayed below. ENSURING THAT THE APPOMATTOX FAMILY WILL CONTINUE TO GROW FOR GENERATIONS TO COME. 80 MILES OFF THE LOUISIANA COAST, THE LATEST FEAT OF ENGINEERING IN THE SHELL DEEP WATER PORTFOLIO IS UNDERWAY. For the last 7 months we’re installing equipment on the seabed., which is going to allow the produced fluids to come to Appomattox. We’ve already reached the point of no return, in which case we need to keep moving and complete the riser. We’ve actually gone to a position where we have to continue laying this pipeline and this riser. Because we don’t have enough space in front of us to keep going and lay the pipeline down. So the team’s fabricating all the pipe joints and all the appropriate quality control measures are in place. The two pipes have to line up so there’s no more than half a millimeter difference between the fit up. We’re talking about half a meter on 20-inch pipe in the Gulf of Mexico on a vessel that’s moving. For four years we do engineering design to get to that stage and it comes down to half a millimeter. It’s kind of astonishing. That’s what we’re allowed. Yeah, it’s right at the seam. Ok, so on this occasion, that weld is good to go. Ok, I’ll call the tower and let them know we’re good to go. Once we’ve completed installing all of the riser section, the next job to do is to transfer the riser to the host. The transfer is dramatic. It’s a really heavy load being transferred from one vessel to the host. We pay our chain out so the bilge can recover the chain. The Bilge and Balder both connect the chain to the riser. Then basically they lower the riser into the water until we take the load. THE CHOREOGRAPHY AT THIS STAGE INVOLVES SIMULTANEOUS OPERATIONS. There’s a lot of SIMOPS risks that have to be managed. You’ve got this very large crane vessel coming in close proximity to the host. You have to make sure that the facility is positioned in the right direction that the vessels need in order to place the riser in the basket. If you miss one step, if one of the chalks doesn’t close properly, then you have a potential problem that everything can take off on you. We’re walking it in slowly. Every step is very smooth and slow, but things can clash so we constantly have people spotting so we make sure we don’t have any steel touching. This is a point where most of the interfaces we’ve been working as a team for the last few years all come together. Alright Stephen, we’re all stop. All right, good job. Riser’s in the basket. Good job, Paul. Way to go, Stephen. When you can safely get it in the basket and there’s no incidents and the day is done. It’s a good feeling. It has been a tremendous learning opportunity for everyone because we have a lot of things that we really had to figure out as we went along. A lot of variables play into these offshore operations and you never know what you’re gonna get thrown at you. But the nice thing is that on eachone of these vessels you have very capable people. Building on Shell’s history of leadership in the Gulf of Mexico, the Appomattox development is a cornerstone of our global deep-water strategy that will drive safe, competitive, and profitable production growth for years to come. The Appomattox development will initially produce from the Appomattox and Vicksburg fields, with first oil by the end of the decade and average peak production estimated to reach approximately 175,000 barrels of oil equivalent per day (boe/d). Shell first discovered the Appomattox field in 2010 and Vicksburg in 2013 and the final investment decision (FID) to advance the Appomattox project was made in July 2015. Since taking FID, Shell has achieved more than 25% cost savings, in addition to approximately 20% cost reduction on the project prior to FID. These cost reductions have been the result of efficient execution, significant well cost reductions and lower market costs. The Appomattox hull, weighing 40,000 metric tons, is the largest floating production system that Shell has ever built. Constructed in Geoje, South Korea, it made its way to Ingleside, Texas, USA, in 2017 where the host platform and subsea infrastructure were added. In May 2018 the Appomattox platform left Ingleside to travel to its final location in the Gulf of Mexico. Production is expected to start in 2019. 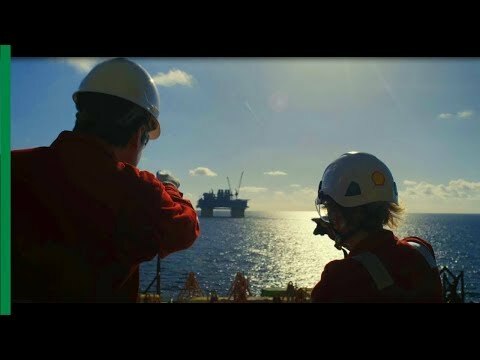 With Shell’s industry-leading position in the deep water, our business is on a growth trajectory, including expanding production opportunities in this area of our Gulf of Mexico heartland. Currently we are the only operator in the Gulf of Mexico with commercial deep-water discoveries in the Norphlet formation, including Appomattox, Vicksburg, Rydberg and Ft. Sumter. Shell continues to focus on the break even price of the project to pursue cost reductions, making this development an attractive and competitive investment in Shell’s global portfolio. As a leading, competitive and innovative project in deep water, Appomattox will continue this legacy to safely, responsibly and efficiently unlock energy resources from this industry-first, frontier development. Read more about how the Appomattox team were able to cut costs on the project without compromising safety. The visual shows the ocean with 16 offshore oil & gas assets on the surface. It also shows the seabed with different depths on the left with a depth meter ranging from 200 to 3,000 metres deep, in steps of 200 metres. Appomattox, one of Shell’s biggest deep-water platforms in the Gulf of Mexico, has left Texas, USA, and is heading to its final location. It was built despite one of the toughest downturns in oil prices for decades. Perdido is the world’s deepest spar, and the second-deepest oil and gas production hub. The Parque das Conchas fields lie in ultra-deep water off Brazil. Several technology firsts have helped to bring the fields on-stream.